Waterproofing Membranes Market size was worth above USD 5.6 billion in 2015, with gains expected at around 7%. 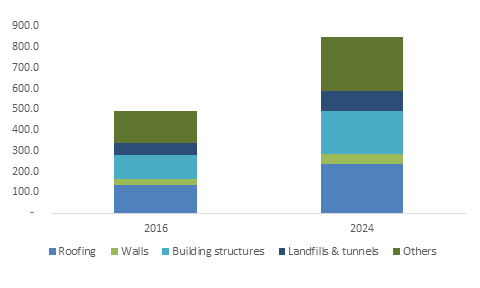 Positive outlook towards increasing durable building materials usage in construction applications should drive waterproofing membranes market size. Global construction industry was valued at around USD 7.2 trillion in 2015. Construction spending in China and India surpass USD 1.5 trillion and 4 billion respectively in 2015. Government initiative to boost construction development in China, India, Indonesia, Malaysia, Japan and Thailand should positively influence product demand. The 12th Five Year Plan of China announced to construct 56 airports and expand 16 airports with a total investment of over USD 65 billion, should favor waterproofing membranes industry growth. Also, UK, Germany, France, U.S., China and India have encouraged activities for land filling and clean groundwater, which would support industry growth. These products form an important element to control liquid penetration by covering the surfaces and forming resistant characteristics. Ample availability of raw materials and key properties which include liquid adsorption quality, flexibility and UV resistance features should drive waterproofing membranes market size. Waterproofing membranes are applied over wet surfaces and waste management industry. Increasing urbanization and tendency to shift industry base in APAC would drive the outlay and produce waste. In 2015, waste management market was worth over USD 400 billion and may be worth around USD 550 billion at the end of 2024. PU liquid membranes find extensive usage in roofing applications. Material growth may be excessively high owing to its durability, versatility, excellent strength/weight ratio and insulation. Inferior construction quality material and poor building maintenance should provide opportunity for rehabilitation and repair, which would boost liquid PU waterproofing membranes industry size. Key feedstocks for manufacturing these products include polypropylene and bitumen. These materials are petroleum based and variations of crude oil index may hamper production costs and affect market price trend. Liquid applied waterproofing membranes market size should register over USD 7.5 billion by 2024. It is cost-effective and provides strength, durability and elongation against harsh weather climate and is best suited for roofing. Preformed sheet waterproofing membrane applications should grow at over 6%. It has advantages including low maintenance & cost and safety characteristics. Sheets can cover openings and link over cracks with higher success than liquid applied membranes. These sheets are used in balconies, bathrooms, roofs and walls. Polymer waterproofing membranes market size was worth over USD 2.5 billion in 2015. Polymers include TPO, PU, PVC and EPDM are main constituents used in product making. These deliver a monolithic application with no layers, leaving no drawback for cracks to develop. Bitumen waterproofing membranes market size should witness at over USD 4 billion by 2024. It is a petroleum based product and is manufactured in two grades, APP butadiene and SBS bitumen. Bitumen is restricted in the U.S. owing to concerns regarding environment. But, in China and India, use of bitumen is present owing to relaxed government norms. Polymer modified cement membranes have good resistance against sunlight penetration and are made in light shades to lower building structure cooling costs. They are mainly used in bridges, subway system, effluent treatment plants, railways, parking structures, tunnels, marine docks, ports and dams. Waterproofing membranes from roofing applications should generate over USD 3 billion by 2024. These products protects from high temperature and have capacity to withhold the weight exerted by pedestrian traffic. Generally, preformed sheet membranes are used, whereas in some cases liquid films are also preferred. Liquid membranes are mostly applied on walls to maintain aesthetic characteristics and reduce cost. Waterproofing membranes market size from buildings structure applications was above USD 1.25 billion in 2015 with a growth rate exceeding 7.5%. The material protects from harsh weather conditions and increasing longevity of buildings. Waterproofing sheets are mainly used on kitchen and bathroom floors, wet rooms and roofs to diminish the chance of prevailing accidents. Liquid based products are also used as a protective coating over the primary paint coat. U.S. market size, should witness growth at around 5.5%. EPA recognized PFOS and PFOA as hazardous materials forcing the manufacturers to exclude fluorocarbons. This norm led to new strategies to be undertaken by manufacturers to increase biopolymer products production by different companies in myriad applications. Europe waterproofing membranes industry size, may foresee over USD 3.5 billion revenue by 2024. European Association declared favorable prices to produce polymer products derived from biomass, thus resulting the market players to provide environment friendly approaches. China market attain installations over 150 mn sqr. mtrs in 2015. Infrastructural development and increasing industrialization has led the regional industry growth. Also, mining activities also fuel regional industry. Global market share is moderately consolidated. Some companies operating in this industry are Dow chemical, BASF, Silk AG, Du Pont, Covestro, Pidilite, Fosroc, CICO Technologies, W.R. Meadows, Soprema Group, Johns Manville, Synergies, Cangzhou Jiansheng Building Waterproof Material and Fairmate Chemicals. Companies including BASF, Pidilite and Dow are present across the value chain and captively use raw ingredients for producing different product grade. Key market players emphasize on mergers & acquisitions and product innovation. In September 2016, BASF announced the acquisition of Henkel’s Western European tiling, flooring and waterproofing business to strengthen its product portfolio in Construction Chemicals. Also in January 2016, GAF acquired Icopal from Investcorp Ltd for approximately USD 1 billion to expand its product portfolio and make a stronger base in European market. In July 2013, Sika acquired JM Texsa and Texsa India, both are manufacturers of waterproofing membranes. Companies undertake technological innovations for new product development which should drive waterproofing membranes industry size. Pidilite recently introduced a new LEC product, an advanced insulation solution provider with key target to provide environment friendly answers for numerous applications. Waterproofing membranes is used mainly to prevent liquid penetration and protect the surface from harsh climate conditions. They can be used either in sheets or in liquid form as coating application. Sheets are generally preferred over flat surfaces whereas, liquid applied membranes are used in case of vertical or slope surfaces. There are several companies manufacturing waterproofing membranes under different brand-names including USG Durock, Renolit and Ardex. Chemical composition varies with the products on which it is applied. The major companies are making technological inventions for new product, which is a key factor for market growth over the forecast period. In 2015, Pidilite company launched an innovative environment friendly Low Energy Consumption (LEC) product which provides both insulation and waterproofing solution for several applications.